Last month, I celebrated the first year of marriage with my wife. We didn’t have a lot of money or time to plan a big getaway, so we borrowed a car and headed up to The Berkshires for an overnight stay in a Super 8 Motel. Not knowing the area, we hopped online to research what fun we might find. 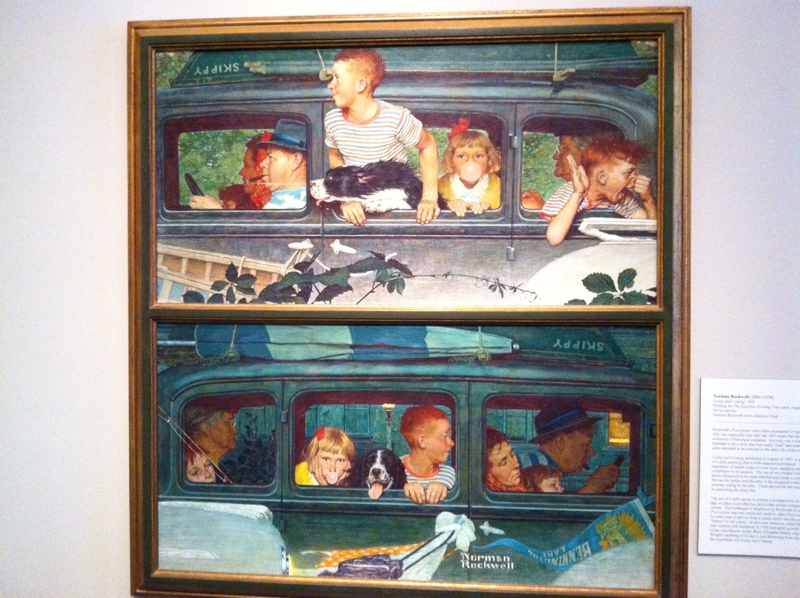 We discovered The Norman Rockwell Museum is in Stockbridge, MA just twenty minutes away from our motel. I was super excited at the chance to see the original paintings made famous by so many Saturday Evening Post covers. My wife was interested, but didn’t share my enthusiasm. “We have to go!” I insisted. She conceded, and we embarked upon what I can only describe as a magical afternoon. 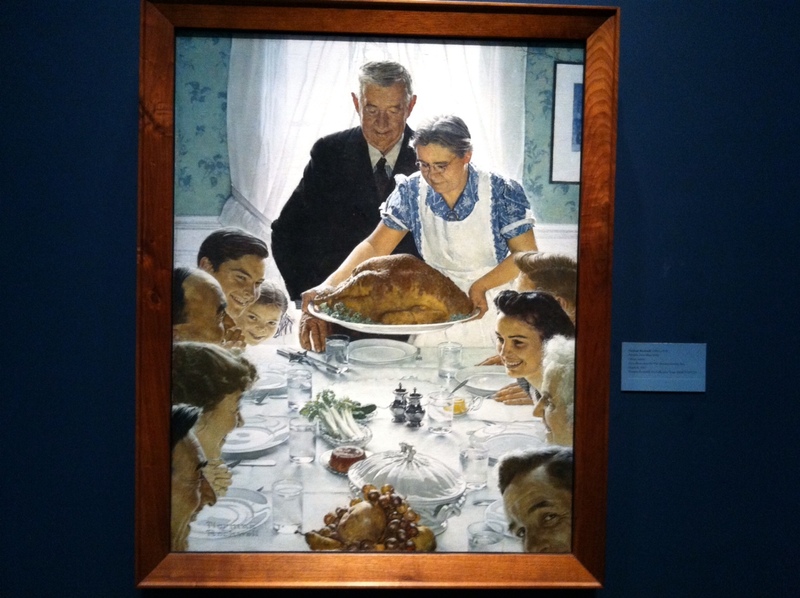 It may seem odd that I was so insistent on visiting the museum, but Norman Rockwell is a childhood hero. My father owns Monical’s Pizza Place in Canton, IL, and when I was in junior high, my mother and he redecorated the small restaurant. They chose to cover one wall with Norman Rockwell Saturday Evening Post wallpaper. The pizza place was my second home, and that wall spurred me to learn about and fall in love with Norman Rockwell. If you look at his work, it’s not exact. Sure, the faces look almost like the photographs from which he worked, but he’s fabricated the scenarios. He was a storyteller; a curator of life, plucking people’s faces to put in his paintings and tell tales about certain times and places. Sometimes, they are iconic, like the family around the dinner table at Thanksgiving in Freedom from Want. 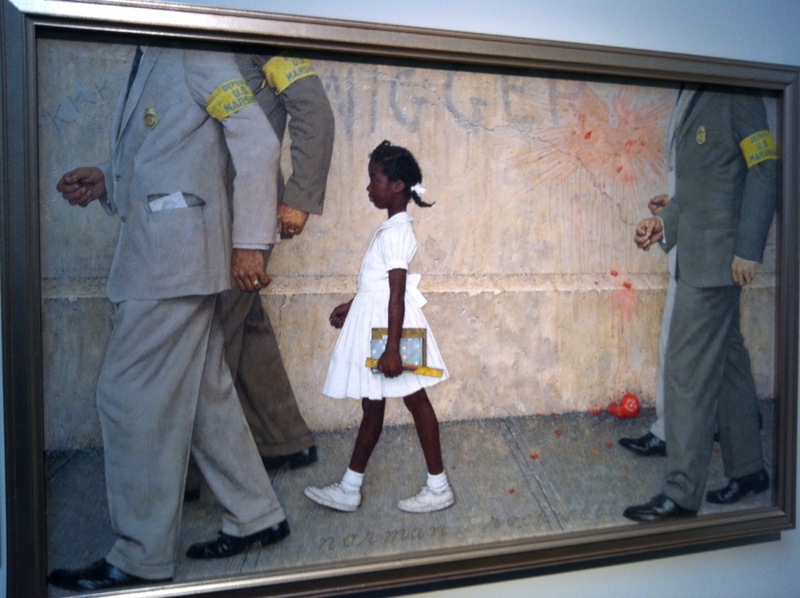 Other moments are highly political and charged with dissonance of the day, like The Problem We All Live With, depicting the real-life Ruby Bridges, a six-year-old African-American girl, walking to an all-white public school in New Orleans, LA on November 14, 1960. President Obama displayed it outside the Oval Office for the first three years of his presidency. That’s how important this painting is. It all deeply impressed my wife. She’d always viewed Rockwell as an art director of magazine covers. A commercial artist who created hazy, iconic Americana. Certainly, at first glance, his oeuvre can feel like this, but the deeper you look, the clearer it becomes: He was a great artist who reflected the times in which he lived with immense passion. Norman Rockwell spoke for generations. His images still influence artists today. Just two weeks ago, The New Yorker riffed on The Tattoo Artist, a painting of a man receiving a tattoo where he’s crossed out his previous girlfriends and adds a new one. 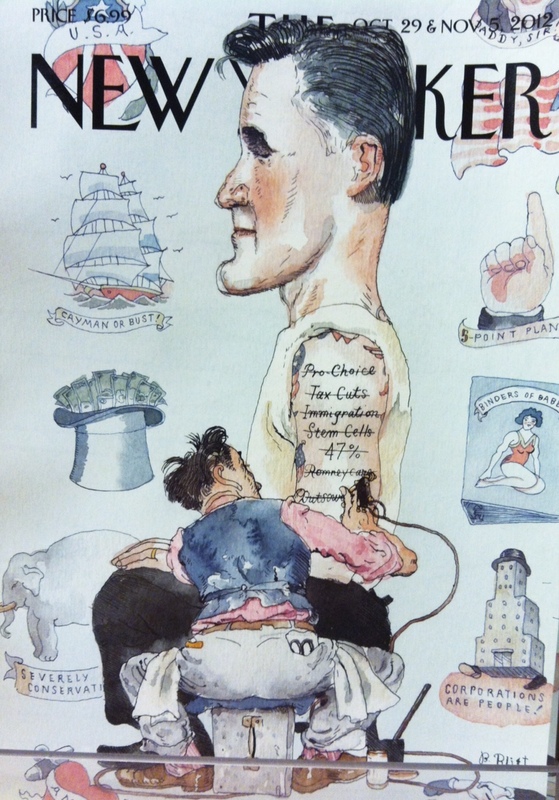 The satirical illustration, Skin Deep, is by Barry Blitt and featured Mitt Romney having old political positions that no longer suit his platform crossed out for new ones. He also influences painters, like comic artist Alex Ross, who has his own exhibition “Heroes and Villains” at The Norman Rockwell Museum from now until February 24, 2013. 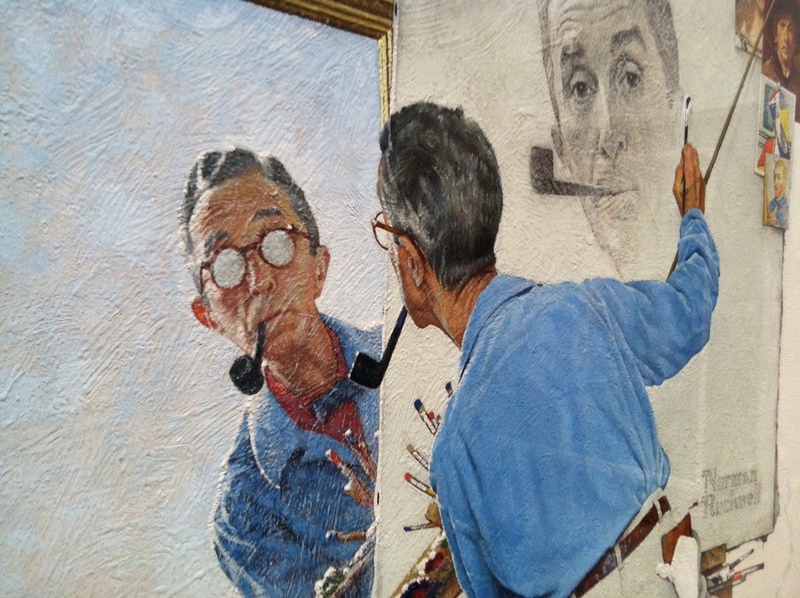 To commemorate Rockwell, Ross painted a portrait of the master specifically for this exhibition. 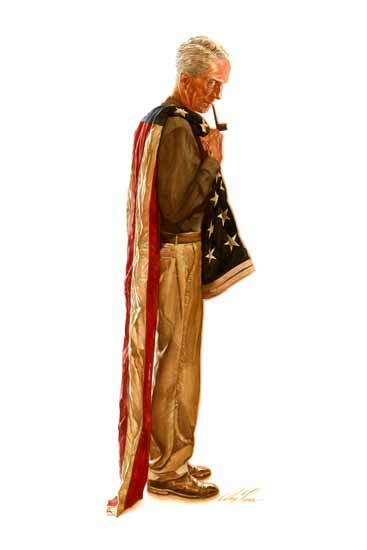 Unsurprisingly, he chose to portray Rockwell as an American hero, draped with an American flag. Norman Rockwell’s attention to detail and subtle storytelling boldly spoke for his own time. That isn’t an easy to do. Often, I see young artists bent on portraying their own lives, which often leads to self-indulgent psychological work to which others cannot relate. As artists, we must seek truth in others and do our best to curate stories that change the way humanity sees itself. Through empathy, we can see others and, hopefully, make a better world. Nicely said. Thanks for visiting the Norman Rockwell Museum. We think that Rockwell and other American illustrators we showcase are amazing reflectors of the time in which they lived and the spirit of the people around them. Thanks for sharing, Joyce. We hope to return for the Alex Ross exhibition at the end of the month. Keep up the fantastic work you do. It’s important. Great description of your trip. I would love to visit there sometime. I remember well the decor of Monical’s Pizza Place – and the pizza, the best pizza anywhere!